Other Europe | Rollo Whately Ltd.
Another example of a Spanish reverse plate frame, great balance between the section, size and ornament. There’s something really satisfying about this frame. 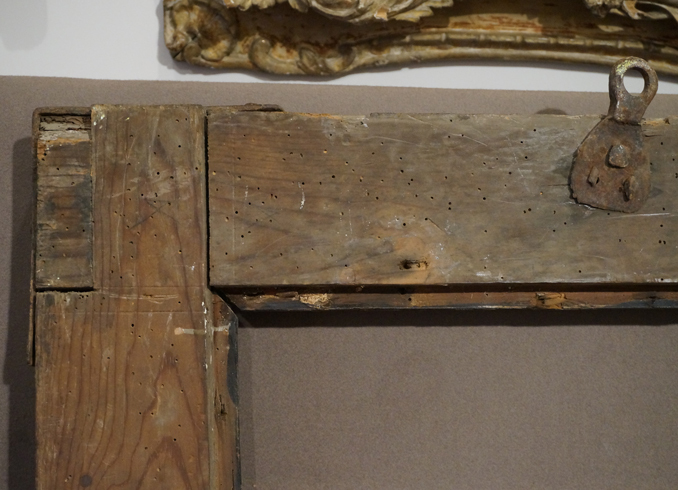 When I bought it, it was just about together — extensive woodworm damage had undermined two of the corners, some of the carving and part of the frieze — all of which has been made good and the wormy back of the frame consolidated. 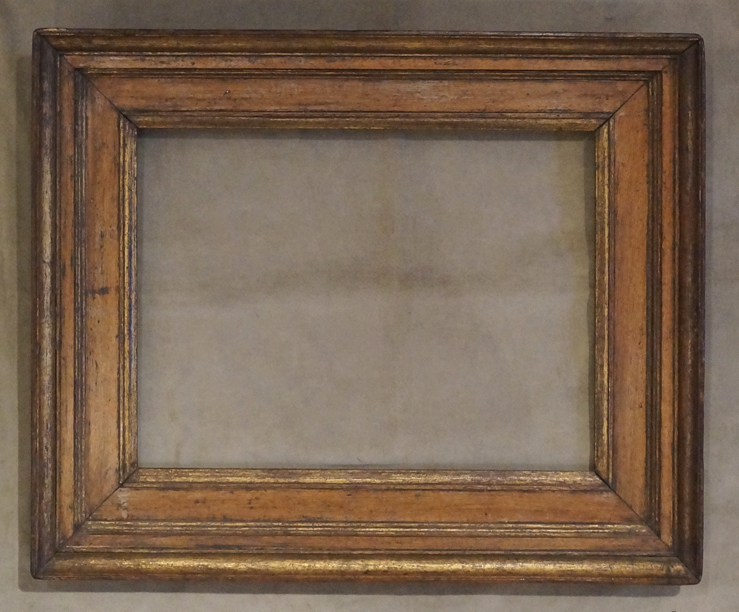 Very fine small Flemish frame with a slot for, presumably, a protective covering for the original painting. The covering, a panel of some sort, would have come down from the top behind the main part of the cassetta section and in front of the inner slip, which would have held the artwork. 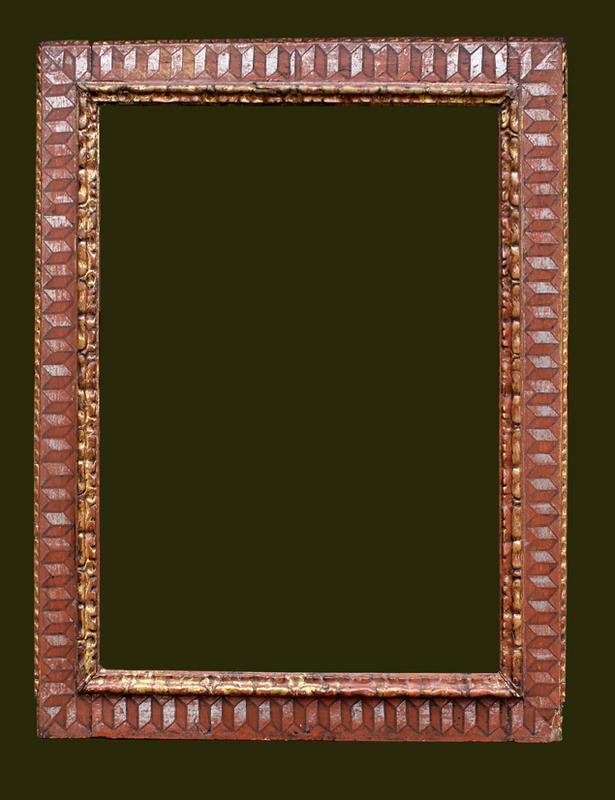 Very typical Spanish reverse frame with carved sight and back edges. Unusual punching in the reverse hollow with foliage and dove-like birds which are charming. 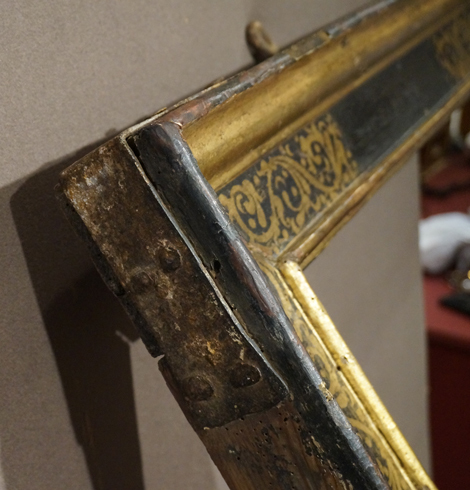 The condition of the frame is not perfect but would make a wonderful mirror. Another Spanish frame, this time cassetta section. Sgraffito is one of various ways of drawing ornament onto a flat surface. The simplest is to paint/draw on a size and brush the gold on top. In sgraffito, gilding is laid and a paint surface put on top. The lettering is then drawn out and the paint scraped away to reveal the lovely gold beneath. In this example the person making the frame couldn’t resist the temptation to punch a little line of dots down the middle of each letter. 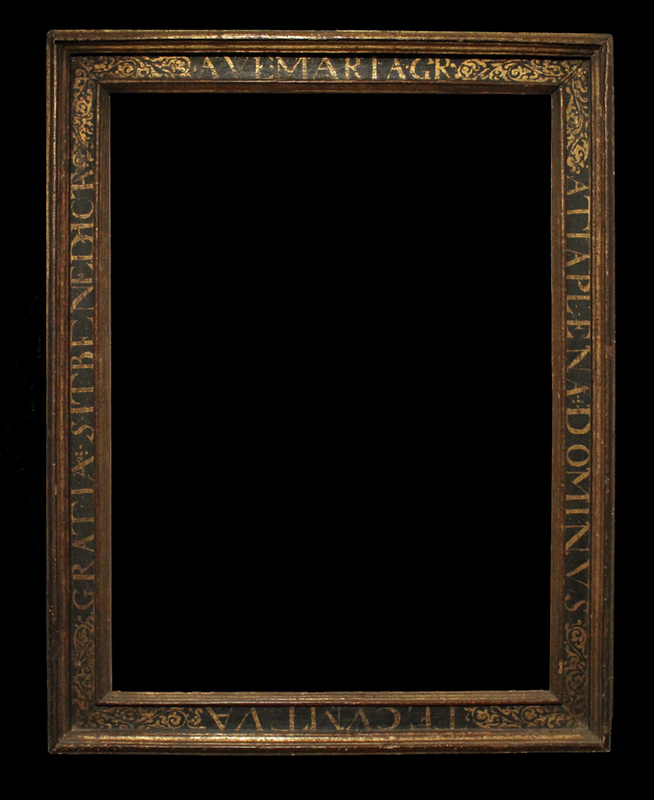 Marvellous Spanish cassetta frame — note how the section has more in common with a Flemish Cassetta frame than an Italian one, particularly the step after the frieze and the gilded ogee section that goes up to the top edge. The top photograph shows the gilding which is very Spanish, thick gold with a top lacquer coat. The corners are done with the drawing scratched into a gilded surface and the black paint drawn around the pattern inscribed (which contrasts to either the sgrafitto technique, above, or that which uses a mordant to apply the gilding on top of the ground). The frame is made of typical Spanish pine and the corners are constructed in the usual Spanish half-lap joint and here reinforced with forged iron brackets. 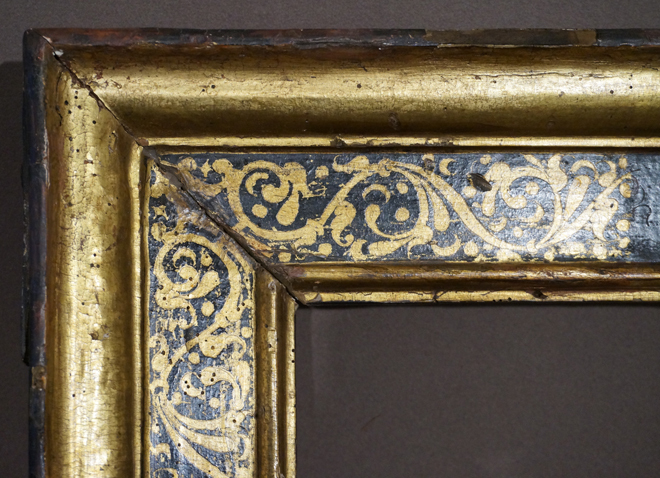 Flemish 17C cassetta frame This Flemish frame, simple moulding run in oak with painted and gilded surfaces. 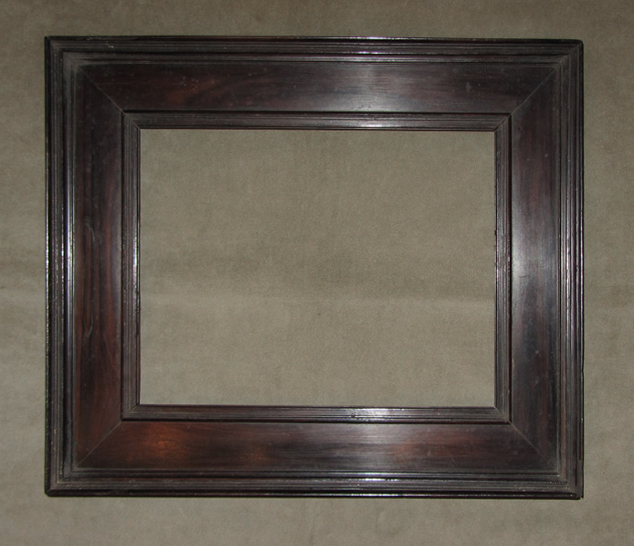 These is one of the types of frames that we make good, traditional copies from, running the mouldings by hand with moulding planes and fixing the corners with dowels, as in the photograph above. Tortoiseshell frames Tortoiseshell frames can no longer be made, of course, and I hesitate to advertise frames made with the shells of what is now an endangered species. These are all, however, antique and existing and there is nothing I can do about that. 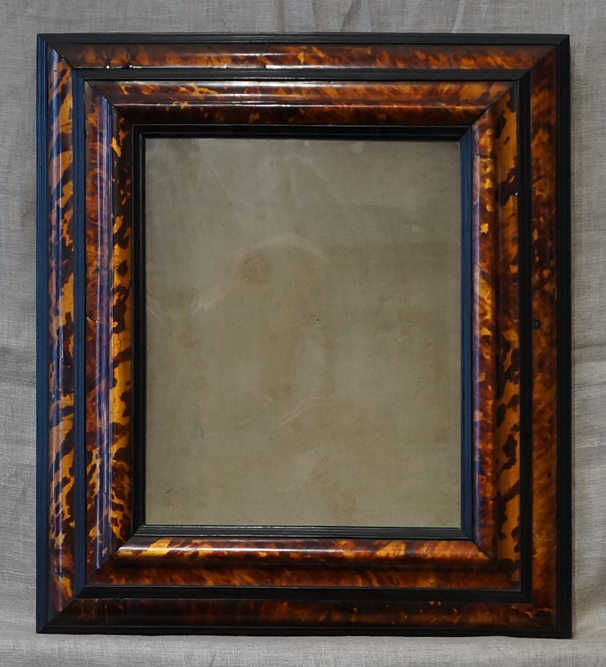 Tortoiseshell was, I imagine, always an expensive and rare material and the care with which it is used on picture frames (and mirror frames) reflects this. Often, as in some of these examples, the translucent tortoiseshell would be backed with gilded foil to enhance the colour and reflectivity of the shell. These examples are from the Netherlands and Northern Italy. Typical Dutch 17C ‘cabinet’ frame. This example is a dark brown ebony, sometimes they are jet black. The Netherlands had extensive overseas interests including Mauritius where they could obtain ebony, a very precious wood that is slow-growing and notoriously hard to work. Ebony was also suited to Dutch Puritanism, which frowned upon the extravagant gilding of the Roman Catholic South. This is not to say that the ebony wasn’t very expensive, because it was, only that it looked plain and puritan! 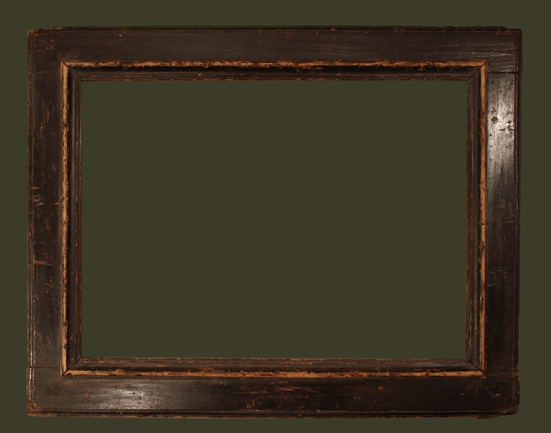 These unornamented frames remain very valuable today. They are easily adapted to size and the quality and hardness of the ebony mouldings means they are often in near perfect condition. 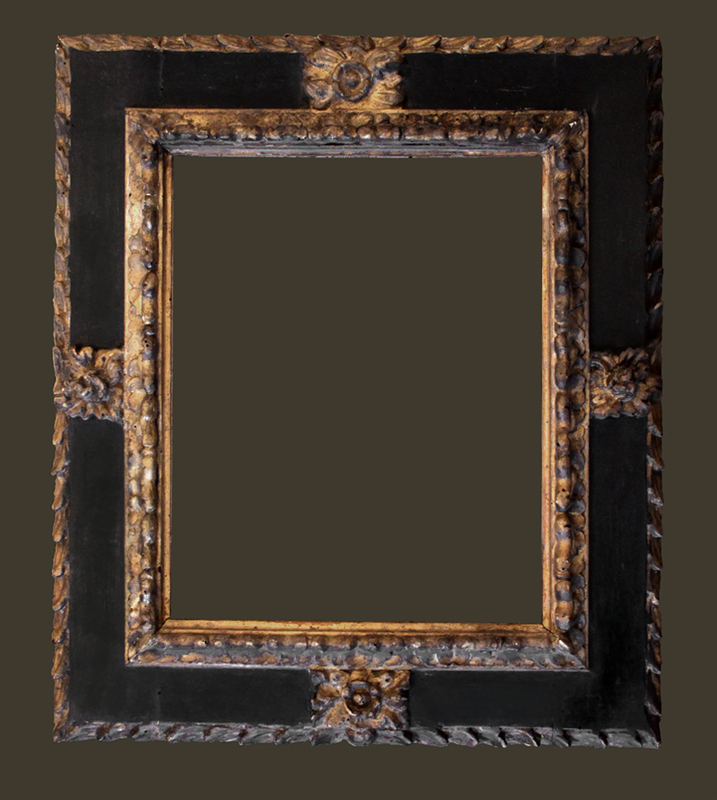 While Dutch 17C frames often used ebony for the black surface, in Italy it is more common to see painted fruitwood, dark brown rather than jet-black. 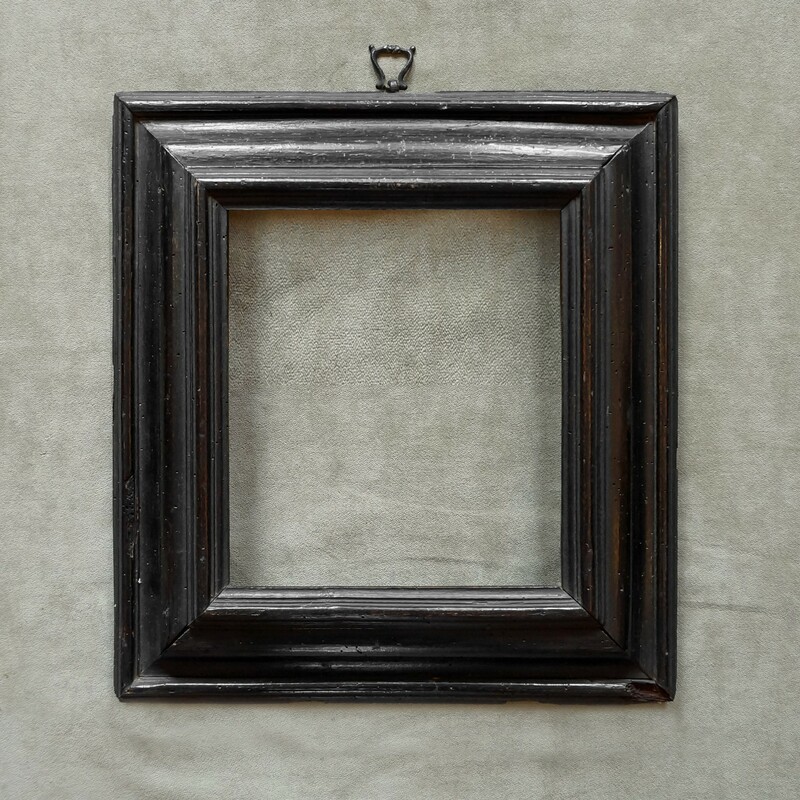 Compared to the Dutch frame above, it is a much softer, warmer object. The fruitwood is also more attractive to the woodworm larvae — you will not see worm-holes in an ebony frame.